Innova has developed and built 5 Tactical Sensor Units (TASSEN) for the Norwegian Navy. The sensor units are based on Innova’s data logger technology. The TASSEN units are autonomous data logger systems, designed to monitor mine sweeps. The system consist of subsea sensor unit, wireless data transmission system and surface monitoring and signal processing software. The battery powered sensor units include hydrophone, magnetometer, pitch/roll sensors and pressure sensor, all monitored in real time. Monitored data are logged, processed and transferred via radio link to the host vessel. 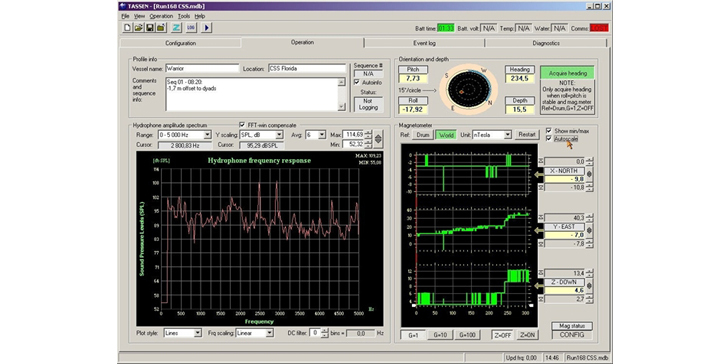 Data processing includes real time FFT analysis to identify peak frequencies.